What do you do when you discover that magic really once existed and at a single point in history just stopped? What do you do when subtle changes in the world and its history are detected implying that other, unfriendly government,s have found a way to travel into the past...? The Rise and fall of D.O.D.O. (2017. 750 pages) is a science fiction/fantasy/historical drama novel, written by Neal Stephenson and Nicole Galland. Stephenson is famous for having written the successful Snow Crash, amongst others, but I am afraid that I do not recognise the book's co-author Galland. The two have produced a mighty tome of a book, based on the idea that a collective belief in science put pay to the everyday practice of magic. The book opens with one of the protagonists, Melisande Stokes, who works at the university as an expert linguist being approached by Tristan Lyons who is working on an intriguing theory about why magic has disappeared from the world and what can be done to resurrect it. She joins the fledgling DODO, allowing the authors to start a running joke about the meaning of the acronym as Lyons refuses to tell Stoke as he considers it a secret. 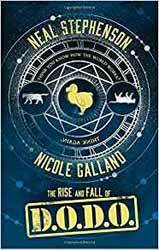 During the first third of the book we see the growth of DODO and the realisation that in order for magic to work today, a witch would have to be completely isolated from the immediate reality. This introduces us to a semi discredited scientist, Oda and his wife and his innovative work which just may sort out their technical difficulties. Having half the puzzle in place Stokes is contacted by Erszebet, one of the more interesting characters in the book, who just happens to supply them with the solution to the second half of their conundrum. With all of this in place the book leaps headlong into a tale of time travel and its associated limitations and problems. All of this was fine if a bit long winded, there is a noticeable shift in the tone of the book with some of the sections being more whimsical and the two authors don’t seem to know whether they want the two main characters to fall in love so the relationship that they do have never really feels real. I have nothing against the central narrative, it is written well with engaging characters, but I do have a problem with the book as a whole. The authors will not be the first to construct a narrative which includes external information, Stephen King's Carrie was almost completely constructed this way, but DODO takes this attention to detail to a whole new level. This book takes the addition to minutia to such a limit that when I reached half way through the book, a section - which contains senate committees, personnel files, Mrs Oda’s continuing horticultural obsessions and a mass of other information which could have either been incorporated into the main story, or really didn’t add that much to the main thrust of the story - my interest started to waver and then finally died. The themes and construction is not unusual for Stephenson. I cannot comment on Galland, and if you like to poke your nose into every nook and cranny that a single tale could offer then you’re likely to be interested in the novel. For my part I felt that the extra information tipped into overkill, interrupting the pace of the story.